Amy is the creative director and stylist of The Timeless Stylist. Designing and styling elegant and romantic weddings using heirloom pieces, for couples who want their day to be as beautiful in 20 years’ time as it is today. Amy founded The Timeless Stylist in 2016 after years of working in the corporate world, where she only dreamed of fulfilling her passion of performing a creative and design-led role. After having her son, she decided this was the time to follow her dream, and created The Timeless Stylist. Amy’s style is easily recognisable and has a beautifully romantic and elegant charm to it. Preferring to work with softer palettes, delicate details and applying precise yet paired back styling, After developing her design, styling and creative direction skills through weddings and successfully published styled shoots, she is now sharing her love of the softer, more elegant and refined style of weddings combined with a fine art approach, through creating The Fine Art Wedding Retreat alongside Hannah Duffy. Hannah is an artist and one of a few photographers in the UK specialising in film photography. She loves using medium format cameras and delights in the luminous softness that film cameras can produce. With more than 10 years experience as a photographer and art director, Hannah has now photographed over 100 weddings. She employs light direction in her wedding work to produce a wonderful mix of beautiful portraiture, combined with documentary photography and styled still life. Hannah’s work has been featured in numerous international bridal publications, including Wedding Sparrow, You & Your Wedding Magazine, Wedding Magazine, Rock My Wedding, Love My Dress, Martha Stewart, and The Times and her work takes her all across Europe and beyond. Hannah’s influenced by the process of creating, history, art, and the natural world but she draws her biggest inspiration from human connection which is why she’s at her happiest when photographing a wedding day. Hannah is now teaming with Amy to share her knowledge and love of creating beautiful wedding imagery through creating The Fine Art Wedding Retreat. Having always loved flowers, gardening and being outdoors Brigitte often felt in her previous life as a school teacher, usually stuck in an over warm classroom, that something was missing. She loved encouraging learning but yearned to engage with the natural world and be more creative on a daily basis. 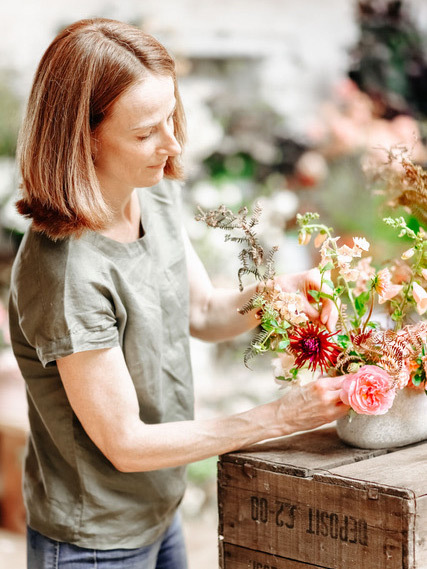 So after retraining as a florist and spending many years honing her craft as a freelancer, Moss & Stone was founded over three years ago. This allowed her the freedom to follow her heart and work with the seasons, using locally sourced British flowers in a very natural, garden style providing considered, floral art for weddings and events. Brigitte's love of teaching continues as she passes on her knowledge, skills and love of flowers to the many guests she welcomes to her Suffolk studio where she runs floral workshops and classes. Brigitte’s seasonal style and relaxed floral designs lends itself perfectly to the world of fine art weddings. A wedding blog for the stylish bride, Wedding Sparrow is a multi award winning premier wedding resource and inspirational website for brides all over the world and we specialise in featuring film photography and fine art weddings. We champion high quality vendors and artisans and love being involved in the wedding community. We believe in the tangible, beautiful, authentic and the inspirational. Filling a gap in the wedding blog industry (Wedding Sparrow is the world’s only all film fine art wedding blog!). Sara knew that her passion for fine art and love for all things tangible and film should be out there via pretty pictures. In just 2 short years, Wedding Sparrow has grown from a tiny one-person blog to a multi-award winning international team of fine art lovers and she couldn’t be more proud. Sara loves how passionate readers and vendors are for quality products and services and hopes this shines through in the blog. Sara is the world’s biggest wedding obsessive and is usually knee deep in wedding pretty at Wedding Sparrow HQ. You’ll find Sara blogging away, attending events, and chatting to like-minded artisans at workshops!